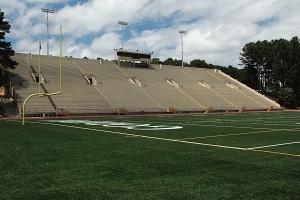 Buck Godfrey Stadium hosting the big Region 4 clash between Chapel Hill and Cedar Grove on Saturday, Oct. 13 at 10:00 am. Pressure cooker wins last Saturday by Chapel Hill and Cedar Grove sets up a big game with playoff implications in Week 8 as they face off in the final regular season game for both teams. The Chapel Hill Panthers (3-2, 2-1) rallied late in the fourth quarter to upset previously unbeaten Bethune (4-1, 2-1) 28-22 at Godfrey Stadium last Saturday for a huge Region 4 win. Trailing by two scores the Panthers found a way to win as Tenieyus Hudson got a key fumble recovery that allowed the Panthers to knot the game at 22-22 with time winding down. The Panthers rolled the dice with an onside kick following the tying score and Omarion Watson recovered for Chapel Hill to set up the game-winning drive. Chapel Hill left just seconds on the clock as the winning score put the Panthers up 28-22. Bethune had built its lead behind Isaiah Logan’s touchdown passes to Armond Davis (60 yards) and Bernard Mack (50 yards) and a 75-yard kickoff return by Davis. Chapel Hill got three rushing touchdowns and a two-point conversion from quarterback Sabian Campbell who also connected with Ethan Patterson on a pair of key passes for first downs to keep drives alive. The offensive line provided big holes for their backs as Elon Patterson rushed for over 100 yards and touchdown and Billy Johnson had several key runs for first downs to compile over 70 yards rushing in the game. Joe Foots had two quarterback sacks and a big safety in the first quarter to lead the Panthers’ defense. Tierion Webb contributed a sack and several other big stops along with his defensive line teammates to slow down the Bethune offense. The Lions’ defense got four tackles, a forced fumble and a fumble recovery by Bernard Mack and four tackles from Jaiden Figaro. Sam English contributed an interception. The win sets up a crucial final regular season Region 4 game that could decide the playoff fates when Cedar Grove (3-2, 2-1), a 22-14 winner over McNair (4-2, 2-2), hosts Chapel Hill (3-2, 2-1) at Godfrey Stadium on October 13 at 10 a.m.
A pair of second half touchdowns propelled the Cedar Grove Saints (3-2, 2-1) to a 22-14 win over the McNair Mustangs (4-2, 2-2) at Godfrey Stadium to keep playoff hopes alive. Naeshawn Parsons returned a punt 50 yards for a touchdown in the second quarter and struck for a 20-yard touchdown run in the third quarter. The game winner was a Jamar Graham touchdown pass to Alvin Williams as the pair connected for the nine-yard scoring play. McNair, which saw its hopes for a berth in the Trail to the Title playoffs for the first time since 2010, got a pair of touchdown runs from Royce Tolbert to keep pace with Cedar Grove. Tolbert added an interception and Markel Banks had three tackles for a loss for the Mustangs. Cedar Grove’s defensive line played aggressively piling up three sacks and three more tackles for a loss. The Lithonia Bulldogs (5-0, 3-0) remained undefeated and atop the Region 3 standings with a 20-8 win over the Freedom Rams (2-3, 1-2) at Avondale Stadium on Saturday. The Bulldogs got a pair of touchdown runs from Jacoi McClary and another by Octavion Tennell for the win. Lithonia can clinch the Region 3 title with a win over the Miller Grove Wolverines (2-3, 2-1) in the final week of play. The Wolverines, who defeated Salem 12-0, could play their way into the playoffs with a victory combined with a loss by Redan (3-2, 2-1). Redan is playing Freedom (2-3, 1-2) in an effort to clinch a playoff berth that final weekend. Five different players scored touchdowns as the Champion Chargers (3-2, 2-1) defeated the Druid Hills Dragons 52-0 in Region 2 action at Adams Stadium last weekend. Two of the touchdowns came via the pass as Arrington Watkins and Kendrick Lackey hooked up for a pair of touchdowns. Ameir Dailey, Jackson Washington, Channing Henderson and Christian Williams all ran for a touchdown in the game. The defense picked up the shutout while Cameron Ferguson and Kyle Mosley each had tackles for a safety in the game. Antretz McDowell had seven tackles for the Druid Hills’ defense. In other games Henderson (5-0, 2-0) shutout Peachtree (0-5, 0-2) 42-0 to tie Tucker (4-1, 2-0) atop the Region 1 standings as the two lock horns for the title on October 13 in a 10:00 am game at Adams Stadium. Ta’jon Corbitt had a 36-yard touchdown and returned a kickoff for a touchdown for the Wolverines. Renfroe (3-2, 2-1) stayed in the running for a playoff spot in Region 2 with a 28-0 win over Stone Mountain (1-5, 1-3).